This Grand Final Eve we’re excited to share our event at "Brown Alley". So submerge yourself in a never forgetting experience enfolding sound and inclusive art. Getting deeper into the vibe this time we’re in the house presenting the King of Melbourne underground scene; BOOGS. Always original and extremely visionary, He has always set a trend. His musical selections and technical skills are not easy enough to express in writing, there is an unquestionable x-factor to what Boogs emits from behind the decks. 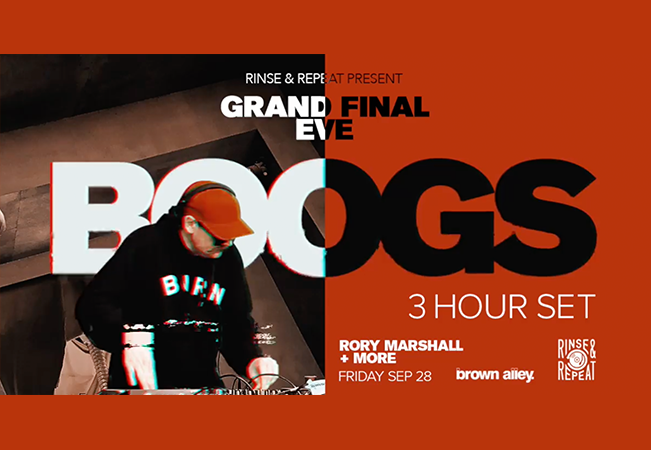 BOOGS have been into the Melbourne rave scene for more than 21 years and have created his own sound. An ongoing affair with Revolver upstairs, Boogs have held one of the longest residences in Melbourne. His 7am sets are true example of mastering the art of building sets all the way from down tempo jam to undisputed banger and back again. Ever evolving and moving and shaking like Muhammed Ali in full flight, We have "RORY MARSHALL" in the house. His unique sound has developed to combine traditional four to the floor electronic thumpers with tribal beats and stirring vocal hooks. Rory has one foot firmly planted in techno and the other foot flailing around across more dance floors and musical genres you could shake a USB stick at. In 2018 Rory's versatile production chops have seen him gain support from the likes of Roger Sanchez and Riva Starr. Rory's recent release on Valiant Records 'Oona' peaked at #7 on the Traxsource tech-house top 100, and spent time in the top 10 of the Aria Club Charts, while at the same time concurrent releases 'Hupen' and 'Esmerelda' were in the Traxsource Tech-house and House charts respectively.